We played five unofficial Pokémon games on PC so you don't have to. One of the most powerful playground rumours of the '00s was that of Pokémon Black—not the legitimate Game Freak release of the same name, but the single cartridge allegedly found at a flea market in 2005. The game contained within played just like Red or Blue, but offered a fourth starter Pokémon, GHOST, whose opponents disappeared from the world with a shriek, taking their trainers with them. Like Momo, the WhatsApp urban legend of a glassy-eyed woman issuing dangerous challenges to adolescents, Pokémon Black was a recurring parental nightmare made manifest—an insidious invasion of a safe space for children, carrying the whiff of death with it. Or was that just the aerosol paint used to coat the cartridge in matte black? If Pokémon Black ever did exist, we’re never going to play it. But the Pokémon community continues to provide in the creepy modification department, and especially on PC—where ROMs have led inevitably to ROM hacks, dodgy downloads that build haphazardly on Game Freak’s beloved JRPGs. If bootleg Pokémon games were books, they would be the type to wear an ‘UNOFFICIAL AND UNLICENSED’ tag proudly on their cover. As I settled in for the day to get to know a handful of notorious Poke-likes, I had a few questions I wanted answered: Was this scene as weird as people, and their parents, say? Exactly how well protected was I against PC-bricking viruses? And would I manage to stay the course without somehow acquiring desktop lag, Sonic fan art wallpaper, and an animated dolphin for a cursor? I steeled myself and clicked to confirm the first unsecured download. You either give up on beating the Elite Four, or you live longer enough to see Bill become the villain. That’s the lesson of Pokémon Fusion Generation, an RPG that on the surface retains the jolly routine of its inspirations. You return to Kanto after becoming champion of Hoenn in Pokémon Ruby and Sapphire. And at first you’re comically overpowered, misusing your level 80 Pokémon to crush the Caterpies of youngsters, taking their money just as they’re starting out on your own adventures. But Professor Oak, in his wisdom, confiscates your endgame gear and plonks you back at the beginning. That’s when you visit Bill on Route 2. The preeminent Pokémon researcher has come up with a new method of evolution that’s caught the imagination of Kanto—fusion. It’s a twist that squeezes new possibilities from familiar monsters. But at what cost? Later in the game, you wind up in Bill’s basement. It’s full of cages, each housing a botched new Pokémon. They’re capable of speech, but you’ll wish they weren’t. "Kill… us," a voice pleads. There’s no way to oblige. "You weren’t meant to see this," Bill says. "I’m not proud of it, but all scientific breakthroughs require sacrifices." I’m not convinced Pokémon needed an Alien Resurrection, but it’s got one. 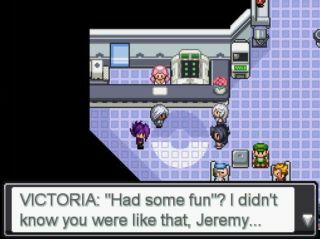 Snakewood, as its title might suggest, is the Pokémon game for edgelords. It’s perhaps the ROM hack that gets closest to Pokémon Black, pitting your Pokémon directly against trainers, and reducing the series’ idyllic setting to an apocalyptic horrorscape. The majority of the trainers you’ll be facing off against here are zombies, and some of their Pokémon are too—Snakewood introduces a new ‘Disease’ type to the equation. Gotta catch ‘em all. If you really wanted to, you might be able to spin Snakewood’s setting as a grand metaphor for environmental disaster, which would just about place it within the same thematic territory as Game Freak’s series. But this is a hack that delights in tipping the cozy tone of the proper Pokémon games into surrealism. When I boot Snakewood up, a Pokémon professor stands smiling on-screen. He’s wearing sandals under his lab coat, and that’s not even the most disturbing development. "On’t seem to remember," begins your internal monologue, mid-word. "I think something very, very odd has happened. Is it just my memory playing tricks me [sic], or was the Pokémon that I just remembered… dead?" On cue, a Pokémon materialises, facing away from you. The plumage on its feathered head identifies it as a Torchic, one of Pokémon Ruby and Sapphire’s starter picks. Except this one’s bright green. "That can’t be right, surely," you muse. "Pokémon don’t die, they just faint and lose the will to fight. Right? The thing is, I don’t think I’m making this up." "Or am I a girl?" The sudden question takes me by surprise, but I decide to confirm that, yes, I am. After that, my trainer turns a gleaming white, and begins shrinking, slowly morphing, ever so slowly… ah. She’s stopped. She’s stuck mid-morph. I imagine this is what Power Rangers go to A&E for. Pokémon Reborn plays in a tiny screen on your desktop, but is huge in ambition. A surprisingly intricate scene unfolds at its opening, panning stereo mimicking the ambient noise of a railway as I journey into Reborn City. And then the train blows up. Remember the station explosion in the intro of Deus Ex: Mankind Divided? Picture exactly that, but with cute sprites. It’s not Team Rocket’s MO, that’s for sure. "You were on the train that exploded," remarks a lady found among the rubble outside. "So was my fiancee." It feels, frankly, inappropriate to ask for tips on type weaknesses. This is a region where the Pokémon are running out. The streets are filled with smog, the water blighted by acid, and the buildings decaying. The battles are similarly tough—I nearly lost my first because I failed to dive straight in with an offensive move. It’s a pretty sobering contrast to a series that’s now at its most accessible after Let’s Go. In fact, despite its roots, Reborn has more in common with the peril of a Square Enix or Atlus production. But it gives you 21 starter Pokémon to choose from, so it feels churlish to complain. It’s a wonder Game Freak has never tried to shoehorn its success into MMO form, turning those trainers waiting interminably on bridges or in caves into other players—true rivals who aspire to more than battling you with slightly-less-powerful Pokémon. Pokémon Planet aims to fill that void, though perhaps it could have done so with a tad more elegance. It’s a little weird to see another player spawn into your bedroom, march past your bed, and head downstairs to see your shared Mom. There’s an undeniable nostalgia to watching people ask each other if they have a shiny Charmander, in public, for the first time since 1998. Your fellow trainers aren’t always quite so supportive as their scripted equivalents, however. "Alt+F4 is overpowered," advises one cunning soul in global chat. "You’ll get banned if you use it." "It’s a whole new world we live in," screams the theme tune of the Pokémon Johto anime, tinnily reproduced on the main menu of Pokémon Adventure. The sentiment is appropriate. No mere emulation tweak, this is a game so fundamentally different from the Pokémon RPGs that it’s hard to find any reference point for it at all. Try and imagine the scene, if you can: you directly control a Pichu walking across a side-scrolling landscape, jumping over obstacles and other Pokémon as you go. Crouch over an open Pokeball, and it will transport you beneath the ground via a tube, or ‘pipe’. When you find question mark blocks in the world, you can hit them with your lovely yellow head to shake out tiny lightning bolts—a kind of currency, or ‘coin’. And Bulbasaurs that patrol the levels can be knocked back inside their shells and then pinged cruelly across the map. It’s difficult to imagine where the creators of Pokémon Adventure might have found inspiration for an idea that arrives so fully formed. After half an hour or so, I’m starting to get used to the sound of Jigglypuff’s skull caving in as I land on its head—crunching the pink dome that charmed a generation. But then, after a few deaths, I respawn inside one of the level entrance pipes. Not down the tube, you understand, but as part of the exterior wall. When I try to escape, the jump sound effect replays over and over, blending into a granular drone that clashes horribly with the upbeat soundtrack. A perky pop singer eggs me on, imploring me to "be the best that I can be". But what if the best I can be is part of the terrain?